ou read that right, Daytona is back and just as it was first time around in the 90s, it’s set to be a game changer. Daytona USA is the pinnacle of arcade racing and now Sega is ready to bring its #1 racer screeching into the 21st century! It revolutionised the arcade scene when it was first launched in 1994, and this franchise can deservedly lay claim to bold statements such as iconic, classic and legendary. This brand new version, Daytona 3 Championship USA, features three brand new tracks including a recreation of the newly renovated Daytona International Speedway. In addition, the original three classic courses have been remastered for the modern era. New cars and new game modes bring more for players old and new to experience. Sega has gone all out on a cabinet design to do this global brand justice and make it stand out from the pack. The cabinet with 47” LED monitor is linkable for up to eight players and lit from top to bottom. It even has a moulded under seat engine! New game features include a live in-game camera system so you can enjoy maximum bragging rights as you overtake your friends! Also brand new to Daytona 3 is the ‘Live TV’ inspired spectator video billboard marquee with 27” display. This allows spectators to see what’s happening in the race, whether it’s a crash, a pass for position or to find out who’s winning or losing! “This is a game changer. This is a premium game that delivers on quality, player experience and operator features that sets a very high bar for arcade video racing games. Importantly we have based it on the original game engine that gave us the amazing ‘AI’ and ‘catch up’ feeling that we all grew to love” commented Patrick Michael, Head of Local R&D. XENOCIDER KICKSTARTER CAMPAIGN IS LIVE!!!! Xenocider is a 3D arcade action game with retro-futuristic aesthetics for Dreamcast, Windows, Mac, Linux and 3DS! An innovative approach to the on-rails shooter genre and the first 3D arcade game for the Dreamcast in over a decade, this is our personal 3D homage to the classic Space Harrier, with a little influence from Galaxy Force and Sin & Punishment thrown into the mix! As we promised, we made our playable demo available for download. Visit the Kickstarter campaign and enjoy! Help us write a new episode of the history of the Dreamcast. Pledge now! Some megadrive mini news ! Features : Migration to OpenGL Core 4.2 for better desktop compatibility and tesselation support on all recent GFX cards. Features : Debug VDP1 & VDP2 are back. Misc : fixed bkram.bin (Panzer Dragon, Story Of Thor and others) (Barbudreadmon). Misc : new kronos.exe icon (François Care). Misc : fixed video filters (François Care). Misc : fixed FPS counter (François Care). Saturn Emulation : Advanced World War Sennen Teikoku No Koubou : Last Of The Millennium : fixes lines on the book (François Care). 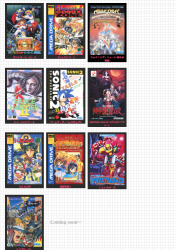 Saturn Emulation : AI Igo : fixes a missing vertical line on the board (François Care). Saturn Emulation : Beach De Reach: fixed transparency problem with dialogs. (François Care). Saturn Emulation : Defcon 5 : fixed missing wall in game (François Care). Saturn Emulation : Devil Summoner - Soul Hackers & Ronde - Otameshi-You (Demo) : fixed missing FMV (François Care). Saturn Emulation : Ginga Ojousama Densetsu Yuna - Mika Akitaka Illust Works : fixed the missing press start screen (François Care). Saturn Emulation : Hi Octane : fixed missing ships in game (François Care). Saturn Emulation : Ippatsu Gyakuten - Gambling King E No Michi : fixed a GFX problem with dialog (François Care). Saturn Emulation : J. B. Harold - Blue Chicago Blues : fixed a transparency problem on the menu (François Care). Saturn Emulation : Joshikousei no Houkago. Pukunpa : fixed missing portraits background (François Care). Saturn Emulation : Langrisser I & II (Dramatic Edition) : fixed white rectangle o*n the menu (François Care). Saturn Emulation : Magical Night Dreams - Cotton 2 : fixed missing cliffs in game (François Care). Saturn Emulation : Scorcher : fixed the line in the pause menu (François Care). STV Emulation : Guardian Force : fixed GFX problem with the background in game (François Care). Translation : added several strings (Benjamin Siskoo). Features : new video option in OpenGL Size : 4x, 8x, 16x (François Care). Features : STV player 2 support (Benjamin Siskoo). Saturn Emulation : Ai Igo : fixed missing vertical line on the board (François Care). Saturn Emulation : Akumajou Dracula X : fixed transition screen (François Care). Saturn Emulation : Alone In The Dark : the game is finally playable after all these years (François Care). Saturn Emulation : Batsugun : fixed now loading screen (text was messed) (François Care). Saturn Emulation : Blam Machinehead : fixed vertical line with the background in game (François Care). Saturn Emulation : Breakpoint Tennis : lines on the tennis field are almost back (François Care). Saturn Emulation : Capcom Generation 5 : fixed a regression with FPS (François Care). Saturn Emulation : Command & Conquer : fixed a regression with FPS (François Care). Saturn Emulation : Devil Summoner - Soul Hackers & Ronde - Otameshi-You (Demo) : fixed videos (FMV) that were not displayed (François Care). Saturn Emulation : Emit Vol.1 : fixed a reboot problem on the press start screen (need to push start quickly to go in game) (François Care). Saturn Emulation : Emit Vol.2 : fixed a reboot problem on the press start screen (need to push start quickly to go in game) (François Care). Saturn Emulation : Emit Vol.3 : fixed a reboot problem on the press start screen (need to push start quickly to go in game) (François Care). Saturn Emulation : Fist : the game is now playable (François Care). Saturn Emulation : Gungriffon : fixed a GFX problem with the mission screen (François Care). Saturn Emulation : Heartbeat Scramble : fixed a GFX problem with the now loading screen (François Care). Saturn Emulation : Hop Step Idol : fixed characters selection screen (François Care). Saturn Emulation : Horror tour : fixed a GFX problem with the now loading screen (François Care).